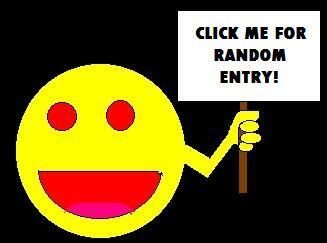 My Entry in the Internet Peanut-Gallery Database « Midlife Crisis Crossover! 1. Manuscripts, Vol. 61, #1, Autumn 1992. The official literary magazine of Butler University, where I attended for 2½ years. I had a poem in there, a satire called “Green Eggs and Ham: A Real Poem by e.e. ginsberg”. I was 20. Satire, parody, and spoofs were my thing. It was a free-wheeling class assignment, never intended or anticipated for publication. And yet there it is, though they didn’t check with me to confirm what I considered its complete title. A few months after I dropped out, my old poetry professor sent me a copy of a recommended poetry book and confirmation that my poem came in second place in a contest I’d never entered. To my sincere shock, a PDF of that entire issue is presently available online, and my two specific pages have been downloaded more than zero times. 2. Far Beyond the Stars #92, January 2015. The official newsletter for Star Trek: Deep Space Nine costars Alexander Siddig, Nana Visitor, Armin Shimerman, and Andrew J. Robinson ceased publication shortly after they reprinted our recap of Starbase Indy 2014 by permission, including seven photos that Anne and I took. (She received credit, too, though my name is misspelled in one sentence.) I see nary a trace of the newsletter online, neither that issue nor the publication’s very existence itself. They graciously mailed me a copy (basically a stapled, old-school fanzine), plus we still have the original entry and photo files, so we’re good. 3. Rauli Virtanen, Riosta Rotterdamin: Suomalaisten Merimiesten Satamareissuja, 2018. The title translates shakily from Finnish to English as “From Rio to Rotterdam: Finnish Maritime Ports”. I’m certain that’s mangling the subtitle. Published by an organization dedicated to Scandinavian maritime history and Baltic Sea conservation, the book reprints with permission a photo we took on our 2015 road trip that included Birmingham, Alabama. 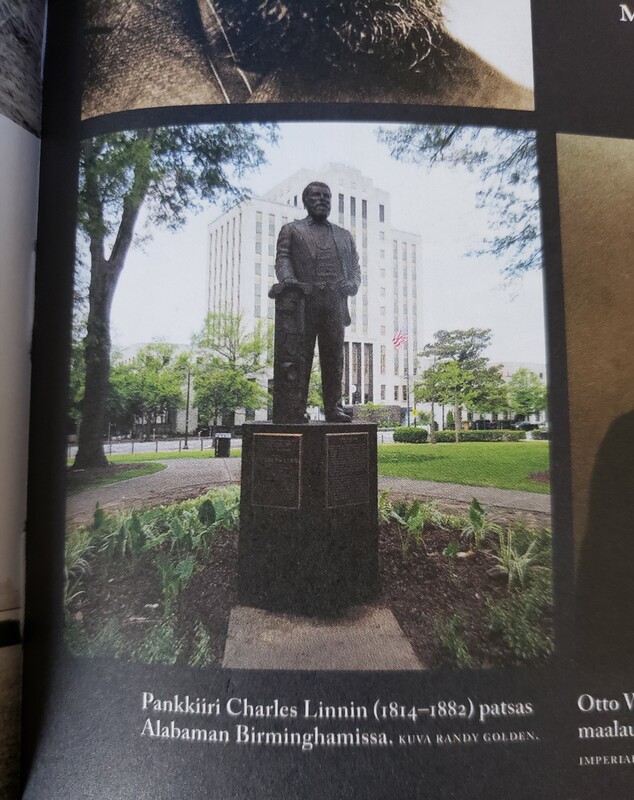 One of the curiosities we discovered that year was a statue of Charles Linn, a banker who helped found Birmingham itself as well as its first viable bank, and whose statue stood in a park named after him. Before he emigrated to America he was a Swedish sailor named Carl Erik Engelbert Sjödahl with experience in sailing around the world a few times and dozens of transatlantic trips on his mileage count. That’s the photo among other photos in our lead photo above. That last one is the new thing that happened this week. My copy of the book arrived via overseas mail Wednesday. So now I’m Randall A. Golden, Published Photographer. They’re not a colossal publisher, but it is a real book. You can even buy it online, though I realize you may not be its target audience, especially if you’re as non-fluent in Finnish as I am. But if you’re versed in it? Enjoy! 12/30/2016: WRTV evening news — On the sorrowful occasion of the death of the legendary Carrie Fisher, a reporter from our local ABC affiliate ran across our own Carrie Fisher story and interviewed me for their segment, an unforgettable Fisher-tale with an Indianapolis connection. 8/26/2017: Wizard World Chicago email newsletter — When you buy photo ops at conventions, the boilerplate for such purchases tends to allow the show to reuse your photos at their discretion in perpetuity. Imagine our surprise the weekend of Wizard World Chicago 2017 when we received an email update/ad whose featured art included a copy of our John Barrowman jazz-hands experience from WWC 2016. I’m glad someone on their social media team found it worthy. Good times, slightly extended. 10/31/2017: Les Témoins d’Outre-Mer — I was one of several American bloggers of varying sizes asked by a French daytime talk show to film myself sharing thoughts about confronting and/or coping with midlife crisis. It was literally my first selfie video — no rehearsal, no tips, no assistance, no editing, two takes. I speak French about as well as I speak Finnish. To this day no one’s told me what the commentators are saying before or after my clip. To this day no one except Anne has cared that this was a very real thing that happened, though the low hit count on their DailyMotion upload gives me the impression their network isn’t CBS France. The Standard Catalog of Comic Books, John Jackson Miller, Maggie Thompson, et al., 2002: I contributed Statement of Ownerships from early-’80s issues of Action Comics and The Flash that the editorial staff of Comics Buyer’s Guide used in compiling historical sales figures. Atomic Robo: Last Stop: I was a Kickstarter backer for this 2015 animated short based on the keen comics series. Fight for Space: I was also a Kickstarter backer for this 2017 documentary about the decline of American spaceflight. …uh, anyway. Updates to my IPGDb entry as they occur. If they occur. If no updates occur, I guess I had a good run. Someone in Finland thinks kindly of me. And my wife thinks I’m cool!